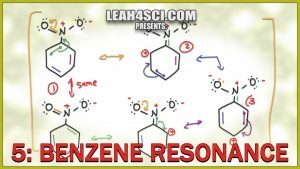 This video will show you how to draw the ‘circle’ of resonance for benzene, as well as resonance intermediates for substituted aromatic compounds including Electron Donating Groups EDG which resonate into the ring and Electron Withdrawing Groups EWG which cause resonance out of the ring. Turn benzene into easy points on your next exam by learning how to double check yourself with the formal charge shortcuts and proper arrow drawing. This is Video 5 in the Resonance Structures Video Series. Click HERE for the entire series.